Tetlow King Planning (TKP) were successful in achiving permission for 11 affordable homes on appeal in Connor Downs village in Cornwall at appeal. The Inspector considered the scheme represented an innovative model of grant free affordable housing, which complied with both national and local planning policies. 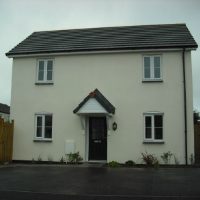 The scheme comprised 11 intermediate affordable homes, located at the end of an existing cul-de-sac, in Connor Downs. The proposal therefore comprised a rural exception scheme, being located outside but adjacent to the existing settlement boundary. “There is strong evidence from the appellant and the Council’s Affordable Housing Officer to indicate that there is significant unmet housing need in the locality”. The proposed affordable houses were offered as a grant free alternative to the traditional provision of social rented and intermediate affordable housing, offered by a private sector provider. The Inspector considered this ‘innovative grant free fixed equity and rent model’ highly appropriate and complementary to the nearby housing association development. The appeal was allowed and can be viewed here. A further application for 15 more innovative affordable homes was subsequently granted permission.